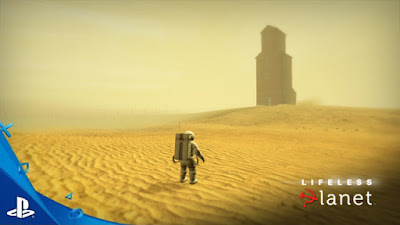 Lifeless Planet: A New 3D Action-Adventure Game from Stage 2 Studios: Lifeless Planet Released for PS4 - Launch Sale Extended! Lifeless Planet Released for PS4 - Launch Sale Extended! I'm proud to announce Lifeless Planet is available now on the PlayStation 4! And better news--we're offering a launch week sale (edit: extended one week!) so you can get the game at 20% off for a limited time. If you're a PS Plus member, you'll get it for 25% off! The sale ends August 2, so get your copy now. Thank you to all our backers, supporters, contributors, investors, and especially to Serenity Forge for publishing Lifeless Planet on PS4! Can't see it on ps store GB, was it released internationally? We haven't released for GB/EU yet but it's coming soon! Just waiting for final approvals. I'll update when I know the date. We don't have final approval yet, but it will be SOON! I can confirm the EU version will get the launch sale too so you won't miss out! Is there a way to get notified when it's released in EU? Yes! Sign up for the newsletter on the right hand side, or follow on Facebook or twitter. We only post to the newsletter with big news every month or so at most.